48HOP (48 Hours of Prayer): This coming weekend, from Thursday 20th March at 4pm until Saturday 22nd March at 4pm, Stairway Church is holding its annual 48 Hours of Prayer. It is held in the auditorium at Stairway Church in Rooks Road, Nunawading. It is a very creative time of being in the presence of God. The activities change every year, but usually there are stations for drawing, writing, having communion, soaking, craft, etc. As you sit or lie, create or be still, the presence of God is so thick and it is a very easy time to commune with God. This is one of my children’s highlights of the year. This will be our fourth time along to 48 HOP and Princess usually attends a total of 12-14 hours in five different time slots over that time. I encourage you, if you live in Melbourne, to bring your children along to this event. You can come any time within those 48 hours. Everyone is welcome. It is a fantastic environment for the whole family to explore God together and individually. I usually go around the stations with Matey to begin with and then he has his favourites he will go back to without me. This is such a significant part of our family calendar and we find that the children benefit so much from it, that we make it a priority for that time. This year, we are trying something new. We are cancelling school for the Friday and going to 48 HOP instead. We are also going to make it special by staying at a hotel nearby that has a swimming pool and buffet breakfast (things the children love). We live a 45 minute drive from church and, by the time we pay road tolls and fuel, the cost adds up. We normally go back 5-6 times throughout the 48 hours, so we are already saving financially by staying close, but more importantly we are making it a very special weekend. You may see Matey help himself to communion 3-4 times in an hour. It would be easy to make a judgement about this but when Matey has communion, he is feeling close to God and wants to show this. It is one of the ways he expresses himself during this time. This year there will not be the prophetic team asking God for words and pictures for people to encourage, comfort and edify them. Instead, the leadership have decided to encourage folk to really spend the time seeking God for themself, learning to listen to what He wants to say to them. God given calling: Last week in Foreverland (the Children’s Church at Stairway), Matey’s group looked at the verse Jeremiah 1:5 “I am your Creator and, before you were born, I chose you to speak for me to the nations.” They were looking at the theme about how they are significant and Matey really resonated with this verse. I was nursing that day and when I returned home, Matey told me the verse numerous times. He kept asking me to contact the leader to get the right words as there were a couple of words he couldn’t remember. I looked up various versions but they weren’t the same. When I got the right wording we printed it off and put it up on Matey’s bedroom wall. He repeats the verse numerous times to himself every day. The other day, we heard him singing it over himself. This verse has resonated with his spirit in a way that no other verse has. It is quite remarkable because before he was born, we really felt to put ‘Samuel’ as his middle name. Samuel means a prophet. Then, when we were in Africa for 3 months, a world famous prophet spoke over Matey saying that he would be a mountain climber, and a prophet to the nations. Our children’s spirits respond to their God given calling over their life. Our role as parents is to help our children discover their God given calling and enter into that. On Saturday, I was involved on the team for the Dream workshop that “Almond Tree Ministries” ran. A great workshop for discovering your dreams and releasing you into them, or perhaps resurrecting your childhood dreams and being given permission to chase after them again. A number of years ago, I realised that I had squashed my dreams and didn’t really know how to dream. My challenge now in parenting is to not make that mistake in how I parent but to parent in such a manner that I enable my children to realise their dreams. What about you & your dreams & your children’s dreams? Encouraging Princess to stick at it even though she’s not the best at it: Princess is suddenly finding swimming squad hard. She has recently gone up a level and it is a huge jump. Last week, she had to swim continual laps of 200m butterfly, breaststroke, backstroke and freestyle with a 5-15 second rest in between. The slower you were, meant the less time to rest in between strokes. Whilst I was watching her training, the coach bawled her out for being slow at one point, and said that if she did that again, the coach would penalise the whole team. The ‘mum’ part of me wanted to step in but I realised that it was a growth journey for her and her learning to push through. I didn’t want to shortchange the learning experience for her. I don’t want her to give up but to learn to push through. On the way home, she commented how hard it was and that she didn’t know if she wanted to do it anymore. Sunday was 100m time trials and Princess was happy because she swam her best. She commented to her friend’s mum that the training was hard but that she was enjoying the challenge. Next week is her 1500m timed trial. She is timed every 200m and each time has to be the same, thus the initial 200m has to be the exact time as her next 200m, and her last 200m etc. This is to get them used to swimming at a consistent speed. Last year when she did this, her times were very consistent, so hopefully her success in this will continue. Mattson Lawson represented Australia in backstroke at the London Olympics. He trained at Princess’ swim school and returned just before the Olympics to give them a talk and have a race with several kids. The mother of his training partners when he was younger was sitting beside me and shared how Mattson was never a great swimmer but when all the other boys, at age 16 left swimming to play football or became interested in girls and gave up swimming, Mattson stuck at it. He gradually, bit by bit, improved his times. He admitted that his mate who was a better swimmer should have had his spot at the Olympics but that mate had come down with glandular fever the week of the Australian swimming championships so Mattson was the second best backstroker in Australia on the day it counted. Looking for the gold in your child: I am learning to look at what sometimes frustrates me about the kids and then looking at that same characteristic through Jesus’ eyes. An example is that Matey is very energetic and will not be someone who will sit and watch the world go past. He will be a world changer. He will get out there and conquer mountains. I need to speak this into him and not get frustrated with the present. During the week, we had a family visit for the day. This family are going to Kenya to be missionaries. Matey and their eldest daughter were energetically and enthusiastically into everything, even getting the water balloons out wanting to use them. This mum was very encouraging of how I talked about Matey’s enthusiasm. I stopped for a moment and realised that “Yes, I had changed”. When Matey was twelve months old, I used to look at the other boys his age who would sit and play with their one toy placed in front of them. I used to wish Matey would be like them, sitting still, never moving, content to play with the one boring car in front of them. Four years later when we met up with these boys and their mums, I was amazed how energetic and enthusiastic about life Matey was compared to them. He always pushed the boundaries. Matey always looked further afield. What was frustrating then is now a huge positive in that he will not take no for an answer. He will find solutions. He will help people in amazing ways by removing boundaries from their lives and seeking ways out of impossible situations. Do you have children like that who frustrate you now? Picture books wanted: We did say “that is enough” with collecting books but we have now been asked to do some more. We have been asked to co-ordinate the collection of 25kg of children’s picture books for the new school in Nepal that we are supporting. Thus, if you have any books you would like to donate, or any money towards this, we are gratefully accepting them. 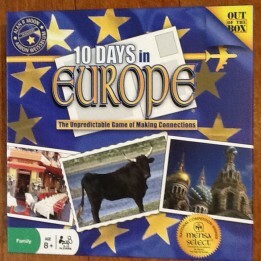 Board games: 10 Days in Europe: I love geography games as a means of learning the names of countries and where they are. This game certainly helps that. If you follow the rules closely though, it will take you ages to play it. We made a few adjustments and found it to be fun, quick and a time of learning. You get to choose 10 cards turned face down, a mixture of countries, coloured planes, boats, or oceans. Basically you have to arrange them in order from Day 1 – Day 10 for a smooth transition from one country to the next. Neighbouring countries go next to each other, same coloured countries can be near each other with the same coloured plane between them to fly from that country to the next. You can boat by ocean between countries on either the Baltic Sea, Atlantic Ocean or Mediterranean Ocean. You can change the order of the cards already in your hand by only changing the position of 2 cards on your turn. This part can take ages so we adapted the rules a bit so that it was faster. The benefit of the game is that we are learning the European countries names and positions in the world. We all enjoyed it. What are your favourite board/card games for learning and having fun with your children? I would love to know.